Phew! Made it to Sunday! My brain has been a bit distracted this week. ‘Twas my girl’s performance exam on Friday and we were all a bit tense in the lead up. So much work, so much rehearsing and it all comes down to how you go in that five minutes on one day. Anyhoo, all went fine, the pressure valve released and I finally regained enough mojo to actually find four photo worthy moments in the week. Was looking for a while like it might be four photos of me rocking in the foetal position! We headed to Wheel & Barrow seeking some last minute props and the girl spied a waffle iron. Always a fan of ‘fun food’, she asked if we could buy it and thus have yummy afternoon teas. In the interests of maintaining a smooth exam week, said waffle iron was purchased and I made waffles the next day for an after school snack. I used this recipe and they worked out pretty well! Crispy on the outside, fluffy in the middle! Well done, Mumma! Having finished my granny square blanket, I needed a new project. With the weather warming up and Christmas approaching (eek! ), I decided to opt for a teddy bear. I’m using this pattern. It’s pretty quick to put together. It will either head to kogo for its Christmas Angel project or Softies for Mirabel, the brainchild of the fabulous Pip Lincolne. Perhaps I’ll make a couple to share the love? Do you like donating things at Christmas? Are you are maker of pressies or a buyer? I finished reading Leap a couple of weeks ago. I wrote a review of it here. You might like to have a squiz and see if this sounds like a book you may be interested reading. Have you read anything good lately? I am not a fan of gardening but come this time of year, when the sun starts to shine and reading outdoors becomes enticing, the prospect of sitting in a weedy, overgrown garden compels me to don the gardening gloves and have a bit of a tidy up. And I’ve been feeling a bit shamed by my Mum saying to me recently ‘Dad and I would like to come and help you in the garden’. I really think as a 45 year old woman I should be taking responsibility for this myself! They’re away at the moment, so they’ll receive a nice surprise when they get home! Do you still feel shamed into things by your parents? Hope your week has been a relaxed one. Do you get tense when your kids have exams? Should I just learn to take a chill pill? If you’d like to see what others have been up to this week, pop over to Isabel’s blog. I can’t wait to see the teddy Carolyn! He looks so cute 🙂 I had gingerbread waffles once, they were so yum! I was always getting shamed into things by the parents, less so now, which is good. Haha. Will have to bring it along to our meet up if I finish it in time! She was very nervous the night before and in the morning before heading to school bit said she was surprisingly calm when she actually went in to perform. Just have to hope they liked her interpretation. It’s always a bit subjective, isn’t it? She said she did get a laugh so that ‘s good (and she was doing a comedy!). I haven’t read anything by Dani Shapiro but I’ve seen her name come up on numerous Facebook posts. I’ll have a look when I next go to the library. The White House book would be very entertaining. That teddy looks gorgeous! My mother comes over and does the weeding. I am all out of guilt about it. Thanks Robyna! What a lovely mother you have! My mum helps me in the garden, she’s much better at it than I! I finished reading The Tiger’s Wife last week, it was magical. Your waffles look very tempting. Parents do just seem to be better at that old housekeeping stuff, don’t they, Dani? I remember I had that book on a ‘to read’ list a couple of years ago and then t seemed to drop off somewhere! Thanks for reminding me of it. I’ll restore it to the list. Thanks for stopping by! How great that you’re making a teddy bear! I really should learn to knit. Alas, I can only crochet, but I always think knitting looks a bit more delicate and lovely. Wherever your teddy ends up I’m sure it will be adored. Thanks, Catherine! She was happy with how it went so crossing our fingers that the assessors liked/agreed with her interpretation. It’s nice to have a bit of variety between crochet and knitting. I think crocheting is more forgiving of dropped stitches! Thanks for stopping by! 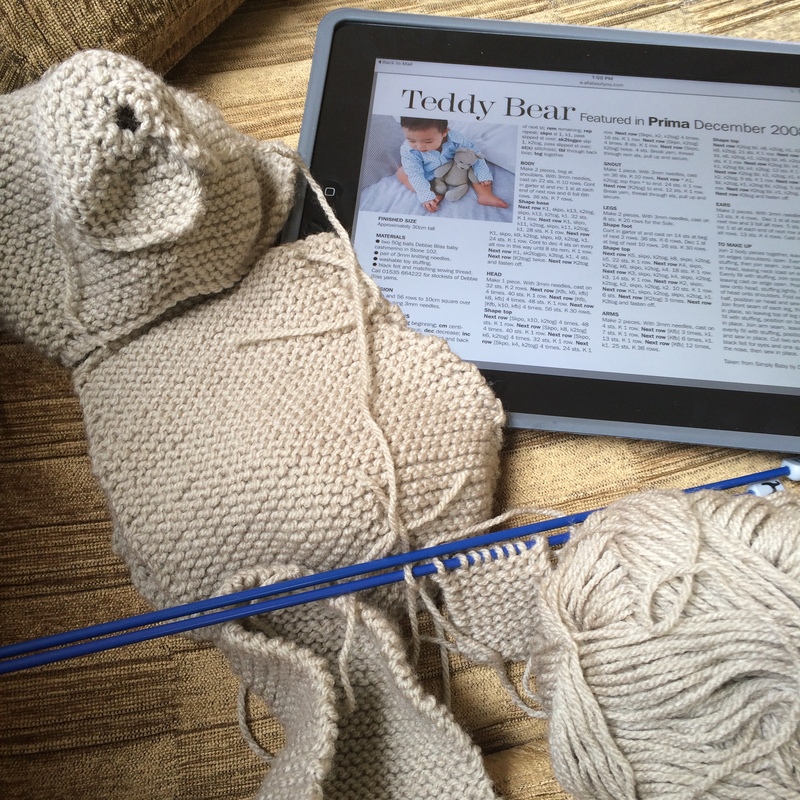 The teddy looks impressive, maybe a bit complicated for my knitting skills! Can’t wait to see him/her finished though. My Dad is always asking if I have mown the lawn although there is not much he can do if not as we live a couple of thousand miles apart, nice that he thinks about my lawn though!! Just started putting the stuffing in the teddy last night, so it’s not to far away! I love that your dad asks about your lawn! Funny what is important to them! I am working on a granny square blanket right now – my biggest project yet! Pleased to have whetted your appetite, Charlotte! I’m sure you’ll love snuggling under your blanket once it is completed. The bear is now just waiting for its eyes and nose! Thanks for stopping by! Well done getting through a tense week, making waffles, knitting and writing a blog post. Superwoman award for you Carolyn. I hope this week is a bit cruisier! Gotta do something to distract the attention! Breathing much easier this week!